There’s nothing like brightening up your space with a fresh bouquet of flowers. They instantly beautify any home or office. However, it’s always a disappointment when your flowers begin to wilt. Learn how to make your flowers last longer with these tips for keeping flowers fresh. If you walk into your local florist, you’ll notice that flowers are kept refrigerated. If you pop yours in the fridge when you go to sleep, you can keep them looking fresh for a week or more. 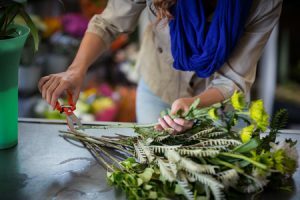 Cutting stems at a diagonal before you place flowers in water and trimming them every few days maximizes the flowers’ absorption of water. Remember, flowers continue to “drink” even after they’re placed in a vase! Make sure the water in your vase is clear and fresh. Also, avoid keeping your blooms outside the vase for too long, as air exposure can dry their stems. Make your own floral preservative with ingredients from your pantry. Dissolve 3 tablespoons of sugar and 2 tablespoons of white vinegar per quart of warm water. The vinegar will keep bacteria from growing, while the sugar nourishes the plants. If you’re looking for a stunning floral arrangement to give as a gift or decorate your home, check out Dallas House of Flowers. We have beautiful bouquets in a variety of colors and sizes, for all occasions. Give us a call toll-free at 1-800-873-0917 to place your order today!